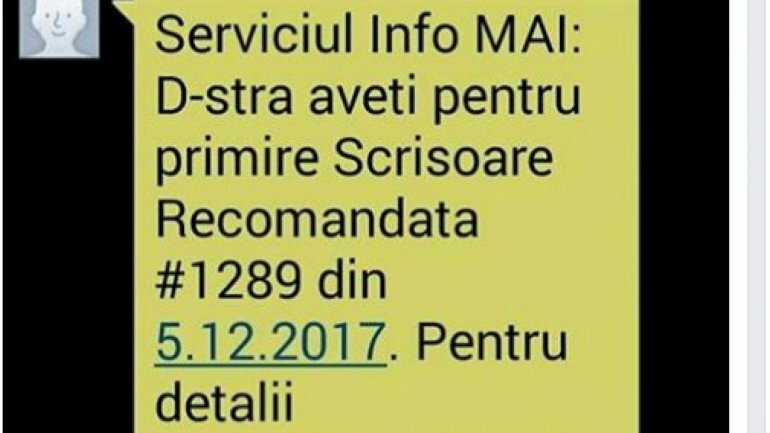 Today, 6th December 2017, National Police Inspectorate, started receiving, from 12:00 local time, complaints from many people who received on their cellphone the following message: "MAI Service: You have received a Registered Mail #2189 from 5.12.2017. For more detail call (8:00 - 20:00) on: +261340551750." National Police Inspectorate announced for all citizens that no competent subdivision of the Ministry of Internal Affairs has sent such messages. At the moment, law enforcement are taking measures to establish all circumstances. For this, National Police Inspectorate urges all citizens to not call on that phone number, as it might be a method of scamming money from people's accounts.